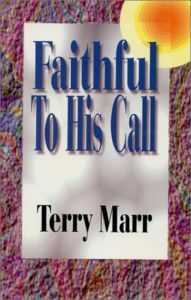 Faithful to His Call by Terry Marr is the story of how a young woman, her husband, and her children came to carry out the purpose that God had for them. Terry Marr felt the presence of God from an early age. She knew that the Lord had a plan for her life, and she strove to be alert to His messages and to be ready when He called. There is a void in the life of many people which school, work, material success, even loved ones and friends do not fill. Through this powerful and frank story of her own Call and her Response, the author presents a way to become spiritually fulfilled, for those who are seeking meaning, and for those who may not yet know how empty their lives have become. Terry Marr’s relationship with God is an intensely personal and dynamic one. In turn, she has ministered to others in the same loving and personal way. As her husband and pastor, L.C. Marr, Jr. says, “This is a book about the birthing of a relationship with God, about visions and the gifts of the Holy Spirit, but mostly it’s about recognizing and appreciating the presence of God.” Not all readers will be able to follow exactly in Terry Marr’s footsteps…each person has his or her own unique gifts and contribution to bring to the world. But every reader will find inspiration and hope in her story, and the courage and incentive to find the way to be Faithful to His Call.